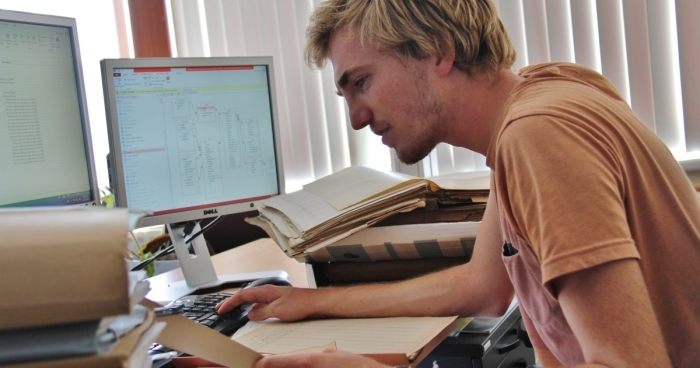 Scientists and data managers from KBIN, UGent, VLIZ, ILVO and ULiège have succeeded in saving a lot of old still analogue datasets on the Belgian part of the North Sea for loss (data archeology). In combining these with more recent measurement results, they obtained a data series spanning over a period of 40 years, which revealed interesting insights. For example, the nutrients phosphate and nitrogen were observed to decline in the southern North Sea. The seawater temperature on the other hand has risen by an average of one degree °C. The data analysts also see a shift in the species composition of the phytoplankton - the small water floating organisms that rely on photosynthesis for their energy supply - accompanied with the risk of harmful species turning up. Since 1985 the sea water in the Belgian part of the North Sea has become more acidic. Photo: The rescue and reuse of old analogue data – data archeology – is a real painstaking job, but useful for long-term insights. - VLIZ. Open access to scientific data is a positive development in modern science. In the marine research world, more and more data on the seas, ocean and coast are freely available to scientists, policy makers, industry and citizens. As an open data policy is very common in the marine science world today. But what about the older marine data? If you want to tackle the old data, there are a lot of specific problems to be solved. Many old valuable data turn out to be inaccessible, because they are forgotten in logbooks and old computer archives. It turns out to be a painstaking job to digitize the analogue data, while old digital data must be made readable again for modern computer software. And how to ensure that the historical datasets are of the same high quality as the recent data with which they are combined? Sometimes older data were once classified as 'confidential', because they were collected for specific projects or by industry. They are still managed according to the rules in force at the time of measurement, a period when no open access policy was in force. All these obstacles make that historical data have a great risk of being lost forever. The project 4DEMON (4DEcades of belgian marine MONITORING) wanted to tackle these obstacles. Within a partnership, KBIN, UGent, VLIZ, ILVO and ULiège took up the challenge to digitize, centralize and quality control the data collected since the 70s in the Belgian part of the North Sea, and make them freely accessible through an open portal. The researchers focused in particular on parameters that measured pollution, eutrophication and ocean acidification; important indicators for studying the health status of our marine ecosystem today. The data go back to the beginning of the 70s, when modern marine monitoring started in Belgium within the framework of the "Project Sea (1970-1976)" where more than 200 Belgian scientists participated. At that time, data management was still in its infancy and the measurement results were simply recorded in logbooks. The analysis of this long 4DEMON data series provided various interesting insights. As a steady decline in the concentrations of nutrients, especially phosphates can be observed. Other nutrients, such as nitrates that are mainly found in fertilizers, also decrease, but less strongly. According to the scientists, this decrease is mainly due to stricter (European) legislation. For PCBs - a group of highly toxic organic chlorine compounds present in synthetic oils used for the cooling of transformers - there is also a declining trend in the Belgian part of the North Sea. In the last ten years, however, local increases have been observed again in the sediments. An observation that certainly pays to be further investigated. Striking is the observed shift in the species composition of phytoplankton in the seawater over the last four decades, in which new – potentially toxic – species are advancing. This shift is most likely due to the rising seawater temperature, which has increased by an average of one degree since the start of the measurements. Algal blooms are also developing earlier in the year. At the beginning of the time series the start fell in April, now already in March. The altered composition of the phytoplankton may have consequences for species feeding on it. Here too, further research is necessary. Lastly, the acidity shows a peculiar curve: the seawater became less acidic in the 1970s until 1985. From then on the seawater became more acidic. In order to understand the interaction between natural and man-made ecosystem changes in the Belgian part of the North Sea, to be able to elaborate policy measures and to measure the human impact on the marine ecosystem, further careful monitoring in the future is therefore necessary. essential. The 4DEMON project ran from 2014 to 2018 and was financed by the Belgian Science Policy (Belspo).